Double up on deliciousness with our Chocolate-Orange Cheesecake Layer Cake. 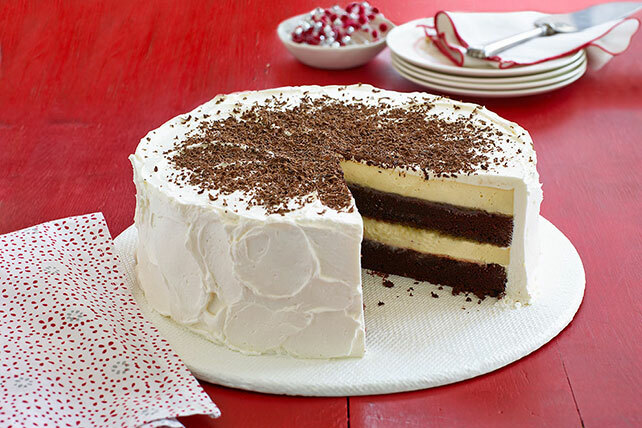 The flavors of Chocolate-Orange Cheesecake Layer Cake are made for each other. Fold 2 (16-inch-long) sheets of foil lengthwise in half twice to form 3-inch-wide strips. Place 1 in each of 2 (9-inch) round pans, with ends of foil extending over sides. Spray with cooking spray. Prepare cake batter as directed on package. Add dry pudding mix; beat 2 min. Pour into prepared pans. Bake 25 min. or until toothpick inserted in centers comes out clean. Remove cakes from oven; flatten tops with back of spatula. Beat 3 pkg. cream cheese, sugar and 1 tsp. vanilla in large bowl with mixer until blended. Add sour cream; mix well. Add eggs, 1 at a time, mixing on low speed after each just until blended. Stir in orange peel. Pour cheesecake batter evenly over cakes. Return to oven. Bake 25 to 30 min. or until centers of cheesecakes are almost set. Run knife around rims of pans to loosen cakes; cool completely. Refrigerate 4 hours. Use foil handles to remove cakes from pans. Place 1 cake layer on serving plate. Microwave marmalade in microwaveable bowl on HIGH 20 sec. ; stir. Spread over cake layer on plate; top with remaining cake layer. Beat remaining cream cheese, remaining vanilla and marshmallow creme in large bowl with mixer until blended. Add COOL WHIP; beat on low speed just until blended. Spread onto top and side of cake. Sprinkle with grated chocolate. Prepare with BREAKSTONE'S Reduced Fat or KNUDSEN Light Sour Cream, PHILADELPHIA Neufchatel Cheese and COOL WHIP LITE Whipped Topping. Omit grated chocolate garnish. Prepare recipe as directed, substituting 1 tsp. raspberry extract for the orange peel, and seedless raspberry jam for the orange marmalade. Garnish with fresh raspberries just before serving.